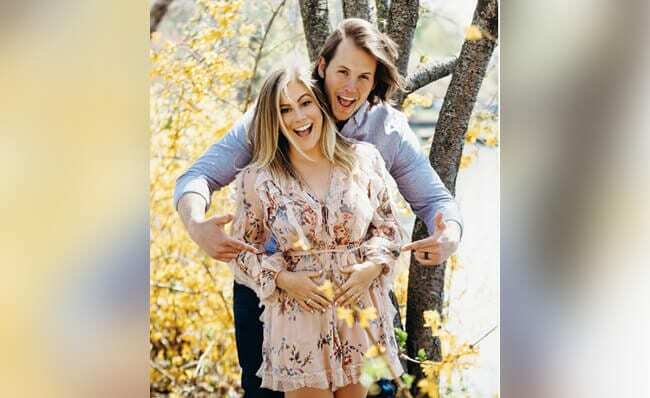 Olympic gymnast Shawn Johnson East and her husband, NFL player Andrew East have not been shy about their struggles with miscarriage. But the pair took to Instagram Saturday with the exciting news that they are expecting! “We cannot WAIT to welcome you to the world and shower you with love,” Johnson East wrote on Instagram. The happy announcement comes a year and a half after the couple shared a raw and emotional video revealing they’d suffered a miscarriage. “We feel like a lot of people go through this so we wanted to share it,” Johnson East said at the beginning of the video. Similar to their last pregnancy, the couple began filming in February to document the journey. In December, Johnson East hinted that the couple would be trying for babies again in 2019 in an Instagram that closed out the year. The excited parents-to-be have already created an Instagram account for Baby East to document all of the exciting updates and joyful firsts they’re anxiously awaiting on this journey to parenthood. We can’t wait to keep up with all of the exciting updates from Baby East’s Instagram account, where the couple is already sharing notes to the journey that brought them here. Previous articleGod Doesn’t See You as Ordinary, So Why do You? Next article7 Old Wives’ Tales for Moms — Debunked!